What’s better than feeling like a trained chef in a beautiful new kitchen? No guarantee on transforming into a chef, but we do guarantee that your client’s kitchen remodel will result in a beautiful space in which they’ll enjoy cooking and entertaining. Our design specialists will help you every step of the way. 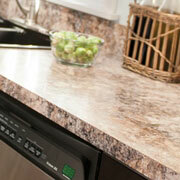 With ProSource® of Rochester products and designers, you can add some spice to your client’s kitchen remodel. Say goodbye to overpriced kitchen cabinets! We’ll provide you with colors, wood species, door shapes, and brands you’ll love — all at our low wholesale prices. 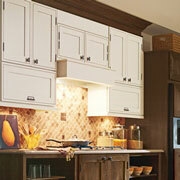 If your client has been dreaming about how they’d design their own cabinets someday, now is their chance to shine. 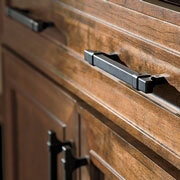 Complete the look of kitchen cabinets with unique pendant, hook, pull handles, or knob cabinet hardware. With so much to choose from, our designers will be a great asset in whittling down the list of potential hardware. If your client is looking for a quality, long-lasting granite countertop or has their eyes on an eco-friendly kitchen countertop made from recycled materials, we can help. We have a range of colors, materials, finishes, and brands to choose from. In a kitchen, this is where function truly meets beauty. Our Kohler kitchen sinks are available with up to three basins, up to six faucet holes, or even with sound-absorption technology to reduce noise from dishes, water, or the disposal. 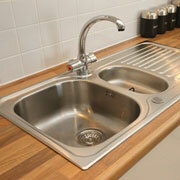 Match the utility of our kitchen faucets with that of your client’s new kitchen sink. 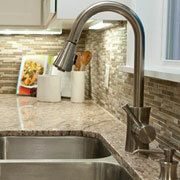 We have pot-filler, beverage, pull-down, and standard kitchen faucets to increase productivity in the kitchen. Even better, they’ll all come in a variety of colors and handle types.